ISIS propaganda trumpets Muslim strength, not grievances. The best way to understand the Islamic State (ISIS) is to see it as the next phase of al-Qaeda. All Sunni Islamic jihadi groups—Boko Haram, ISIS, Taliban, al-Shabaab, al-Qaeda, even Hamas—share the same motivations based on a literal and orthodox reading of Islamic history and doctrine: resurrecting a caliphate (which existed in various forms from 632 to 1924) that implements and spreads the totality of sharia, or Islamic law. Accordingly, ISIS's notorious atrocities—beheading, crucifixion, sexual enslavement, and destruction of non-Sunni places of worship—are being committed by other jihadi groups (e.g., Boko Haram and al-Shabaab, both of which pledged allegiance to ISIS) and even by some Muslim governments (e.g., Saudi Arabia) and individual Muslims around the world. Conversely, although al-Qaeda (AQ) adheres to the same sharia that ISIS implements, it has long waged a propaganda war against the West. AQ portrays all terrorist attacks on the West, including 9/11, as mere payback for the West's unjust polices against Muslims, including support for Israel and Arab dictators. ISIS' strategy inspires Muslims, while losing Western public opinion. To maintain this "grievance" narrative, AQ knows that the innately supremacist and violent aspects of sharia—for example ISIS' destruction of churches and subjugation of "infidel" Christian minorities—need to be curtailed or hidden from the Western world. Otherwise AQ's efforts of portraying jihadis as "freedom fighters" resisting an oppressive West risk being undermined. Regardless, AQ's strategy of turning Western opinion appears to have borne fruit in one pivotal area: canceling longtime Western support for secular Arab dictators. In the context of the "Arab Spring," the Obama administration turned its back on America's Egyptian ally of 30 years, Hosni Mubarak; helped ISIS-affiliated jihadis overthrow Libya's Gaddafi (even though he was complying with Washington); and continues supporting ISIS-affiliated "moderates" to overthrow Syria's Assad. Idealists in both government and media forgot a primary reason the U.S. had formerly supported secular Arab dictators: they single-mindedly opposed the jihadis. The result has been a new and emboldened phase of the jihad, a.k.a., ISIS. Born and entrenched in precisely those nations that U.S. leadership brought "freedom and democracy" to—Iraq, Syria, and Libya—ISIS (or al-Qaeda 2.0) is now indifferent to Western opinion. By widely broadcasting its savage triumphalism in the name of Islam, ISIS forfeits the "grievance card" but plays the "strength" card, thus inspiring millions of Muslims. According to the Pew Research Center, in 11 countries alone, at least 63 million and as many as 287 million Muslims support ISIS. Yet even ISIS works in stages. When criticized by Muslims for killing fellow Muslims and not attacking Israel—the supreme enemy—ISIS responded by saying it was following the pattern of the historic caliphate founded in 632. Then, Caliph Abu Bakr beheaded and crucified tens of thousands of Muslims for apostatizing. Only after the rebel tribes were brought back into the fold of Islam were they set loose to conquer European/Christian territories during history's early Muslim conquests (634–750). Indeed, it is believed that ISIS' caliph Abu Bakr al-Baghdadi took this name to signify his focus, that is, terrorizing all "hypocrites" and "apostates" until they unify under the caliphate's banner. It still remains to be seen whether ISIS' strategy—inspiring Muslims but losing Western opinion—will succeed. According to polls, "Islamophobia" is on the rise in the West, especially after the rise of ISIS, prompting several politicians to speak more candidly about the catalysts for terrorist violence. The Obama administration's weak responses feed into AQ's narrative that Islamic terrorism at least in part reflects Islamic grievance; and it refuses to connect the actions of any jihadi organization—whether ISIS, al-Qaeda, Boko Haram, et al—to Islamic teaching. Time will tell whether the next administration will remain willfully ignorant of the nature of its jihadi enemy—which is fatal in war according to Sun Tzu's ancient dictum, "know your enemy"—or whether reality will trump political correctness. See "An Analysis of Al-Qa'ida's Worldview: Reciprocal Treatment or Religious Obligation?" Also, The Al Qaeda Reader, which separates the organization's communiqués into two groups: "Propaganda" messages to the West portraying jihadi terrorists as mere freedom fighters, and "Theology" messages to fellow Muslims, preaching the same Islam of ISIS. See "Al-Qaeda: Defender of Christians?" for a more elaborate explanation of this theme. For the Syrian Free Army's role: "Largest Massacre of Christians in Syria Ignored." 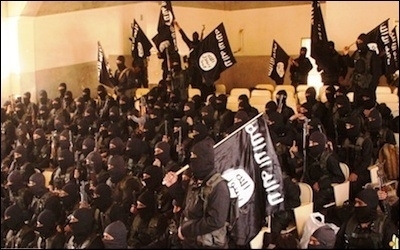 "Pew poll: Between 63 million and 287 million ISIS supporters in just 11 countries." "New Islamic Caliphate Declares Jihad on ... Muslims."